UPDATE: Parrot admitted the story was fake. Scroll to the bottom for more on this. Newshounds in Auvergne, France will soon have a new way to catch up on the headlines. 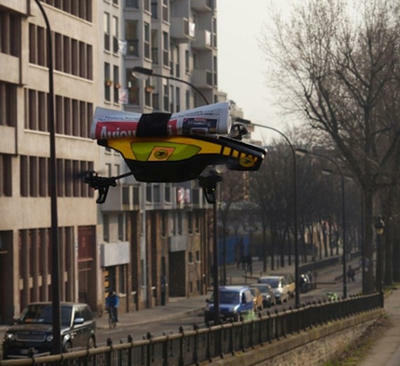 The local mail service, La Poste Group, will be launching a new pilot program this May to offer drone-delivered newspapers to residents of the central French province. This follows previous testing of drones by postal workers who controlled the copters using specialized iOS and Android apps. Like the tests, the new pilot program, dubbed "Parrot Air Drone Postal," will rely on Parrot's quadricopter drones. It may be April 1, but this is no joke. [See below.] And better yet, Auvergne may not be alone for long. The Federal Aviation Administration also has been passing regulations allowing for commercial drone use by Fall 2015. And FedEx, which has been a huge supporter of such automated deliveries, has a plan in the works to unleash hordes of drones as part of its services. These compact copters are increasingly presenting some interesting use-cases. (No, we're not talking about the Tacocopter, though we were just as bummed as anyone that this drone-delivered Mexican food turned out to be a hoax.) There are obvious benefits for military use, as well as disaster response services, but adopting them for public-facing applications — like law enforcement — are turning out to be trickier. Virginia, for example, proposed placing a two-year moratorium on law-enforcement surveillance drones to give lawmakers time to hash out regulations governing their use. But for basic, non-surveillance-oriented services, like small postal deliveries, the same privacy issues don't apply. Without such complications gumming up the works, there's less to stand in the way of remote-controlled, mechanized deliveries like this. And you know what that means — maybe the Tacocopter isn't totally out of the realm of possibility. At least we hope. For more on Auvergne, France's new drone-delivered papers, check out The Atlantic via the source link. For more on the Tacocopter, hit play on the video below featuring Stephen Colbert doing what he does best. Enjoy. UPDATE: La Poste Group and Parrot fessed up and admitted this was a joke. The item was picked up by some of the leading news sites, media wires and blogs in the country — in other words, professionals who can usually sniff this stuff out a mile away — meaning the larger community got punked in one fell swoop. Including us. So alas, it seems we'll have to wait a little bit longer to see unmanned drones get integrated into our everyday lives. For more information, you can check out NBC News' coverage on the prank here.